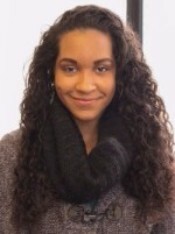 Brittany Rabb ’19, a sociology major and Emerging Scholar, was awarded a 2016-2017 Welter-Muzic Undergraduate Research Fellowship in Child Studies for her project “The Role of Neighborhood Cohesion in the Likelihood of Intervening in Suspected Child Maltreatment.” Rabb intends to present her research at the American Sociological Association annual meeting in 2017. Why did you choose to study these subjects? Originally, I was a psychology major because it was the only social science field that I had been exposed to in high school. When I started attending CWRU, I found that sociology was a better fit for me. Regarding my minor, I have known since a young age that I want to work with children, specifically disadvantaged youth. What is your favorite class/faculty member, and why? It would not be fair of me to pick just one favorite faculty member. Both Tim Black and Jessica Kelley-Moore have already been instrumental in my short time at CWRU. In Tim Black’s introductory sociology course, he was able to introduce me to the field of sociology in a way that made me say, “Why would I want to study anything but sociology?” Since then, he regularly checks in with me to see how I am doing and to occasionally discuss my research interests. I have taken three of his courses, and they were all amazingly insightful. Jessica is my academic advisor, and she is truly a role model. She has helped me with my research by not only teaching me the logistics of writing and analysis, but also the professionalism and social dynamics needed in this field. I have been in contact with her almost weekly since I first took one of her courses, and I must say that she is an amazing advisor and I am grateful for her presence in my life. I feel as though I did not choose CWRU, but that CWRU chose me. I was originally committed to Cleveland State University because at the time, it was the most affordable place for me to go. But in June of 2015, I was notified by the financial aid office at CWRU that they wanted to offer me a full ride scholarship, which I could not pass down, given that CWRU was my dream school. Being able to attend this school without having to worry about the finances is truly a blessing and I’m very grateful for this experience. I would like to thank the family of Louis Stokes, who so graciously fund my full tuition scholarship. The professors and the course offerings. I am amazed by the education I have received at this school. The course offerings and the professors are diverse, which is important to me. At the start of every semester, I am always excited to establish relationships with professors and to pick their minds. I love the diversity in Cleveland. I am drawn to city life because there are a range of different races and income levels and I think that fact makes it an interesting place to work and go to school in. The summer going into my freshman year I was able to participate in the Emerging Scholar’s Program where I developed relationships with great mentors and other faculty around campus. Also, I’ve been able to work on a project on child maltreatment in Cleveland neighborhoods. I got this position as a freshman and through doing work on that project, I was able to come up with my own research question, which is the question and paper I have submitted for the ASA Annual Meeting and have received funding for. I am involved with Case Club Volleyball, and I previously participated in CWRU’s Symphonic Winds, Symphony Orchestra, and Chamber Program. I enjoy reading and playing flute. I work at the local schools in my community with young musicians to develop their skills and musicianship. I believe that coming to CWRU and maintaining a high GPA has been my biggest accomplishment. I did not believe that I would get to go to CWRU because I could not afford it, but once I got my scholarship and committed to CWRU, I could not have been happier. Being here is great, and then succeeding here adds to that as well. I was worried that I might not do well here, given that Case is such a rigorous school, but because I found my academic niche and a supportive community, I have been able to thrive. In five years I see myself hopefully completing a Master’s of Social Work degree at the Mandel School. Five years from now I want to be searching for my place within the Cleveland public sector so I can begin my career as a practitioner in under-served communities.